"We have some amazing food artisans in Chattanooga. Whether it's coffee, ice cream, cheese, or chocolate, the quality and craftsmanship of what you can find in this city is tops. There are so many great local restaurants in this town. Some may be slightly off the beaten path, but the culinary talent here makes most places worth the effort it takes to find them." The supper club takes place four times a year in various settings. This dinner featured guest chef Daniel Lindley (St. John's, The Meeting Place) and co-founder Erik Niel. 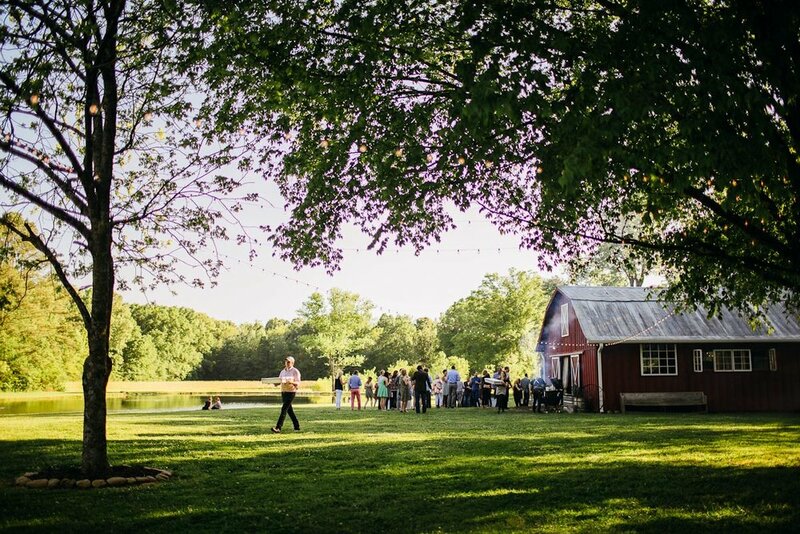 This dinner took place under the stars at Everlee Farm in Chattanooga. Guests gathered at a distillery for a dinner prepared by Niel and guest chef Josh Habiger of Nashville's Pinewood Social. A twist on the salt-roasting process that usually uses fish, Niel made this dish with ham. The table is set for dinner at the former Wheland Foundry and US Pipe site just off of Riverwalk. Photo Credit: Michael Brooks, Jr. Experience Chattanooga's culinary scene without going to a restaurant at chef Erik and Amanda Niel's pop-up dinners. The goal of these multi-course meals is to shed light on Chattanooga's emerging restaurant scene. Niel brings in a guest chef, as well as local bartenders, farmers, and artisan producers. 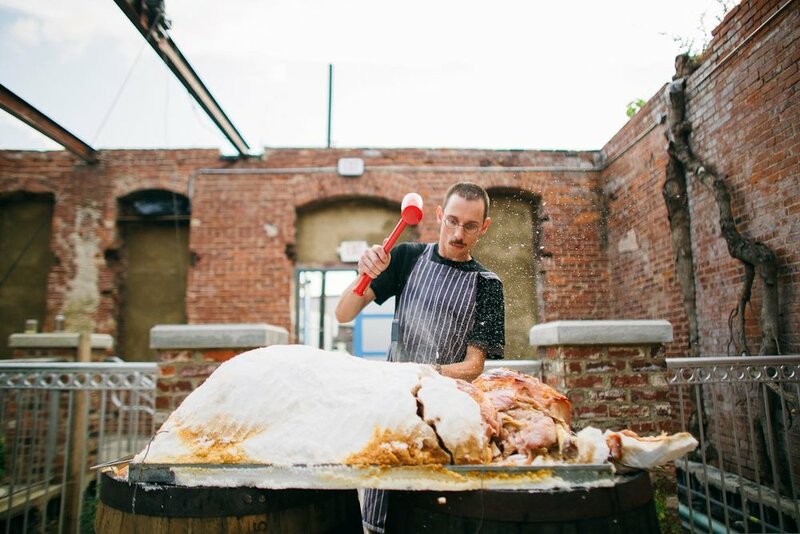 The series consists of four dinners annually, one per season, and each dinner takes place in a unique setting: a farm, a barn, a distillery, a foundry. The next dinner with be on February 12th, 2017 at Loveman's Department Store and will feature guest chef Kevin Nashan of Sidney Street Cafe and The Peacemaker in St. Louis. "The seasonal SCSC dinners are the most uplifting moments I have every year in Chattanooga. The opportunity to work simultaneously with visiting chefs and local talent is emotionally fulfilling, and it always reminds me of why I love working in the hospitality industry. It is like getting an extra recess period in grade school – it feels like the best thing that has ever happened to you." "Come here for a hearty American breakfast served all day." "It’s a little, one-man, Greek tour-de-force. While it’s in a heavily-traveled tourist area of town, it’s just outside of the normal walking route that most people take…so it feels like a hidden gem." "The avocado popsicle at Local Juice on Main Street is crushingly good and good for you." "I love this spot for a mid-day ice cream cone and I am particularly partial to the Key Lime Pie. Their chocolate chip is great because they use stracciatella. It has tiny flakes of chocolate that they mix in when the ice cream is freezing at the very end. It crumbles and it becomes this really cool chocolate chip." "It is a little greasy spoon shack and is the oldest restaurant in Chattanooga. Come here for a cheeseburger and fries." "This is a very old school Southern Chattanooga restaurant and their speciality is fried chicken. I think they dip it in honey. You sit at a giant table with a Lazy Susan and in the middle they put creamed spinach, corn, friend okra, green beans, tomatoes, and you spin it around and eat what you want." "This is old school, loosen your belt buckle kind of food. They make fried chicken to order and have with a great beer program, specializing in 40 ounce beer. They do one of most ridiculously savory apps which is smoked sausage, pickles, and white cheddar cheese with spicy stuff like cayenne and paprika and salt sprinkled all over and crackers. You just can't stop eating it." "Fried pork chop dinner (especially after a long night of drinking), strong cocktails, velvet wallpaper, and an incredible jukebox. It's the first place that I came to in Chattanooga that I thought was cool. Until I came here I didn't think I would stay. You walk through a vacant hotel lobby and into the back room with a perpetually hanging Happy Birthday sign. The bartender is the cook and the server. You order chicken, he vanishes to the back, comes back to make you a drink and then back to check on the chicken. Takes awhile, but it is pretty damn good." "Dive bars and cold beer seem to resonate with chefs after a gig." Located in the center of the city, chef Erik Niel describes this as "specializing in seafood bistro food with a Southern twist." From their raw bar to the dishes that range from Braised Beef Brisket to Trout a la Grenobloise. Chef Erik Niel's Southern butcher shop and restaurant. They work with local farms and serve sandwiches and charcuterie. Chef Bryan Lee Weaver of Butcher & Bee gives his tireless and in-depth guide to eating, drinking, hiking, and dancing in Nashville. He also throws in an off-the-beaten-track whole hog BBQ joint. Chef and brewmaster's guide to the best joints for bites and brews in Nashville. From dining with locals at a supper club to hidden gems, here is chef Erik Niel's guide to Chattanooga.